An innovative new holiday experience, Glisten Camping brings some truly unique glamping accommodation to sunny south-west France. Like the domes themselves, the concept is simple. 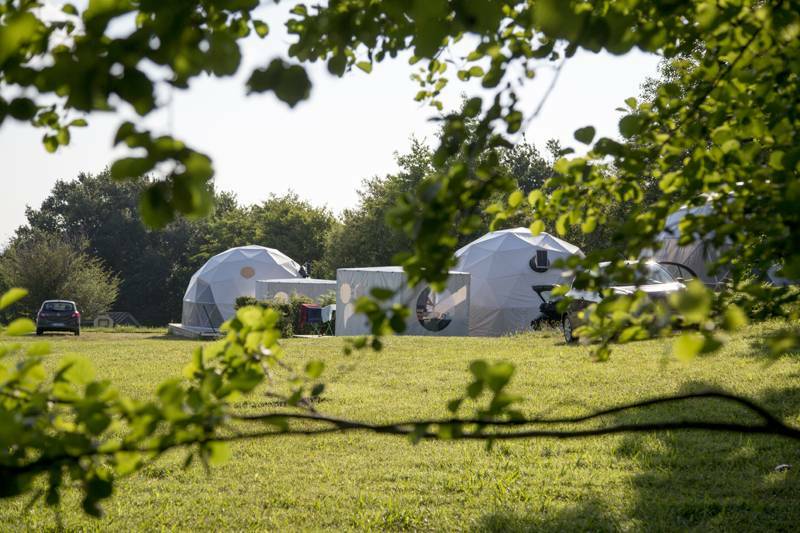 The brainchild of Cornish-based camping nut Simon Thomason, Glisten selects the best locations in south-west France then sets up the distinctively stylish geodesic domes, which sleep a family of up to six. As Simon succinctly puts it, “the great outdoors deserve a beautiful indoors”. And then some. Inside, the domes are a triumph of ergonomic design that would have even Kevin McCloud struggling for superlatives. These stylish pods come complete with partitioned bedrooms, king-size beds and proper mattresses, hanging beds for the kids, and ultra-comfy Fatboy bean-bags. There's also a cool yet functional ‘plancha’ gas cooker and a spacious covered al fresco dining area for those long, lazy, holiday meals. So chic are these dextrous dome-iciles, it wouldn't surprise us if the St Tropez set migrated westward along the coast for a spot of glamping. As all cool campers know, location is everything and Glisten certainly scores top marks for that. Col d'Ibardin, the first campsite on which the Glisten domes have been located, is a relaxed, family-friendly retreat that boasts all the bells and whistles we've come to expect of campsites in this part of the world (clean, modern facilities; swimming pools; decent bar & restaurant). This bucolic Basque bolthole lies at the foothills of La Rhune and is ideally located to explore the other natural delights the region has to offer. With its sweeping golden sands, enchanting pine forests and traditional mountain villages, Le Pays Basques – where France's Atlantic Coast meets the Spanish border – it isn't hard to see what makes this such a magnet for camping fans. And while it also boasts some of Europe’s warmest temperatures, the cooling sea breeze of this breathtaking Atlantic coastline means the only thing you need sweat over is what enchanting corner of this region to explore next. 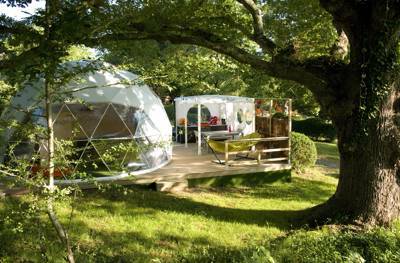 Space-age domes in the French south-west – modern glamping at its best. For latest availability and best prices for Glisten Camping - Col d'Ibardin, please use the Date Search above. 6 geodesic domes sleeping up to six. Swimming pools (2 for kids and one for adults), children's play area, onsite bar restaurant, kid's club, small farm, plus plenty of games including petanque, table tennis and basketball. Explore the surrounding hills and forests or take to two wheels – Glisten can organise bike hire for the whole family, as well as surf hire and lessons. For something less labour intensive, take the vintage Train de la Rhune (0033 559 542 026) to the first summit of the Pyrenees – the views from over 900 metres high are spectacular. There's plenty of beaches to choose from too, with St Jean de Luz, Socoa and Hendaye among the nicest and nearest. The Basque region straddles some of the most spectacular sites in both south-west France and northern Spain. Take in the glamour of Biarritz or chic San Sebastián (Donostia to the Basque). With a wealth of delicious local produce and treats to be sampled (including Bayonne ham and Basque cake), most dome-dwellers opt to cook their own on the plancha grill provided. 'La Kantina' – the onsite bar & restaurant – serves up decent, good value meals and regional specialties such as axoa. Eat al fresco on the terrace or enjoy some private fuss-free dining with the takeaway service. Basic provisions can also be purchased from the onsite shop, open 7 days a week. For something extra special, make the short pilgrimage to San Sebastián, the city with the most Michelin stars per square foot in the world. If your budget won't stretch to the haute cuisine heights of Arzak (0034 943 278 465), saddle up at a harbourside tavern for some traditional pintxos and some good Rioja. Minimum stay 2 nights and prices per night start from £75.00 in low and mid season. Weekly rentals are from £399 low – £856 during peak season. From the north, take the RN10 and the A63. Take exit 2 – "St Jean de Luz south - Urrugne - Col Ibardin." At the roundabout, leave by the exit for Urrugne. Turn left and continue along the D4 to Ibardin D4 for 4km. At the intersection, continue straight towards Ascain. The site is located 200 meters down the road on the right.